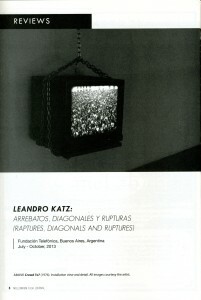 “Leandro Katz: Arrebatos, Diagonales y Ruptures” offers visitors the rare chance to immerse themselves in the numerous visual thought pieces the artist created during his 40 years as an Argentine in New York City as well as more recent work produced since Katz’s 2006 return to Buenos Aires. Committed to a personal filmmaking practice that covers experimental ethnography (Los Angeles Station, 1976 and Paradox, 2001), New York City downtown absurdist theater (The Grand Tarot of Charles Ludlam, 1987), transcendent politics (Crowd, 1976 and The Day You Will Love Me, 1997) and Mayan modernism (Twelve Moons and Moonshots, 1976), Leandro Katz tackles each of his projects with visual rigor and ingenuity. 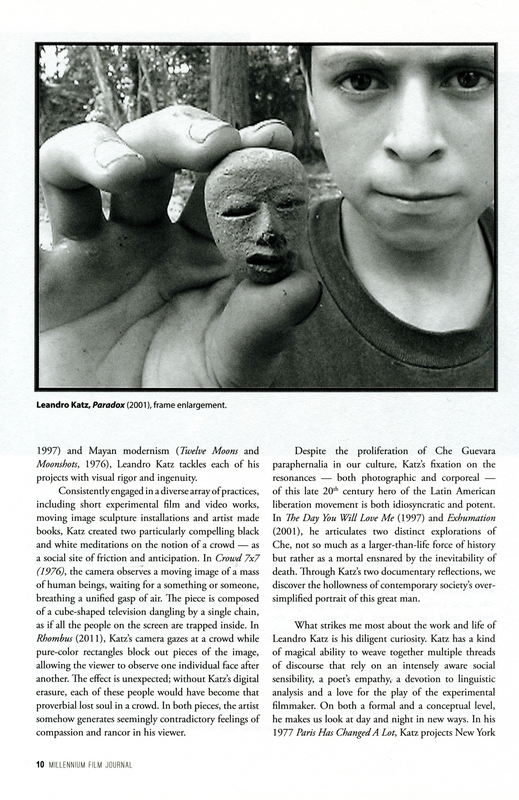 Consistently engaged in a diverse array of practices including short experimental film and video works, moving image sculpture installations and artist made books, Katz created two particularly compelling black and white meditations on the notion of a crowd – as a social site of friction and anticipation. 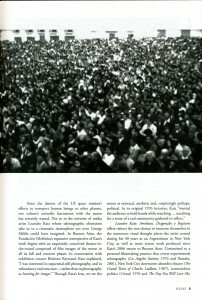 In Crowd 7×7 (1976), the camera observes a moving image of a mass of human beings, waiting for a something or someone, breathing a unified gasp of air. The piece is composed of a cube-shaped television dangling by a single chain, as if all the people on the screen are trapped inside. In Rhombus (2011), Katz’s camera gazes at a crowd while pure-color rectangles block out pieces of the image, allowing the viewer to observe one individual face after another. 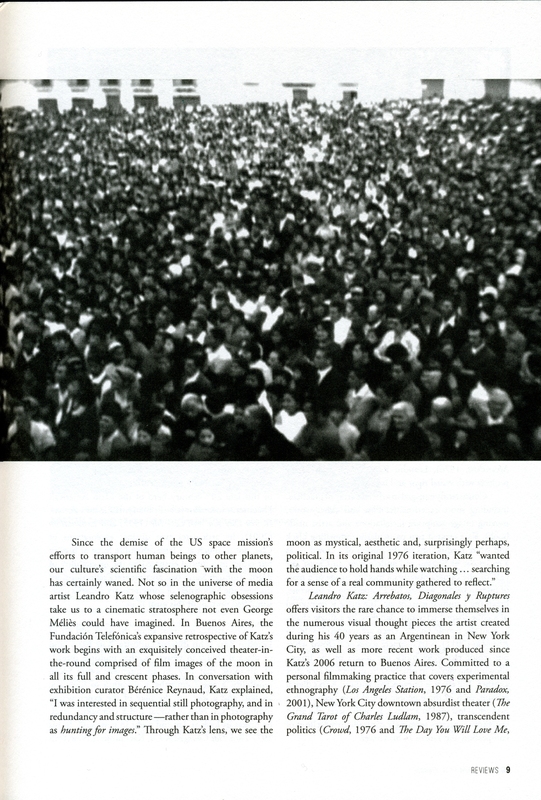 The effect is unexpected; without Katz’s digital erasure, each of these people would have become that proverbial lost soul in a crowd. In both pieces, the artist somehow generates seemingly contradictory feelings of compassion and rancor in his viewer. 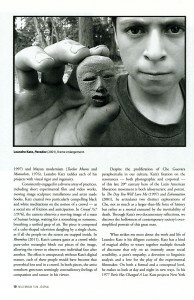 Despite the proliferation of Che Guevara paraphernalia in our culture, Katz’s fixation on the resonances – both photographic and corporeal — of this late 20th century hero of the Latin American liberation movement is both idiosyncratic and potent. 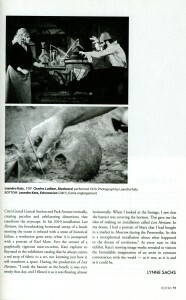 In The Day You Will Love Me (1997) and Exhumation (2001), he articulates two distinct explorations of Che, not so much as a larger-than-life force of history but rather as a mortal ensnared by the inevitability of death. Through Katz’s two documentary reflections, we discover the hollowness of contemporary society’s over-simplified portrait of this great man. What strikes me most about the work and life of Leandro Katz is his diligent curiosity. 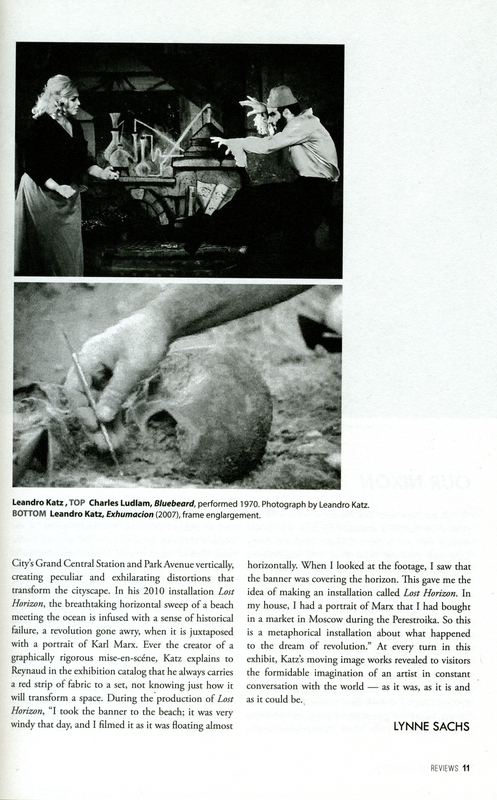 Katz has a kind of magical ability to weave together multiple threads of discourse that rely on an intensely aware social sensibility, a poet’s empathy, a devotion to linguistic analysis and a love for the play of the experimental filmmaker. On both a formal and a conceptual level, he makes us look at day and night in new ways. In his 1977 Paris Has Changed A Lot, Katz projects New York City’s Grand Central Station and Park Avenue vertically, creating peculiar and exhilarating distortions that transform the cityscape. In his 2010 installation Lost Horizon, the breathtaking horizontal sweep of a beach meeting the ocean is infused with a sense of historical failure, a revolution gone awry, when it is juxtaposed with a portrait of Karl Marx. 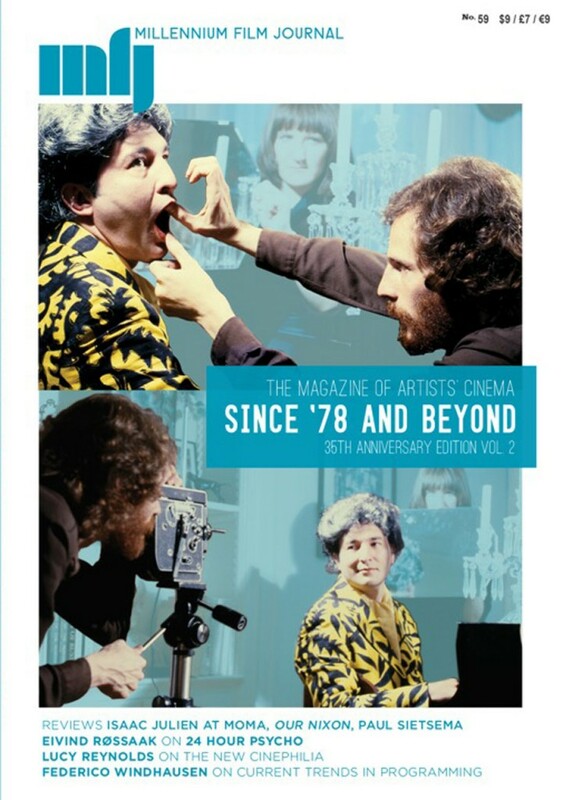 Ever the creator of a graphically rigorous mise-en-scéne, Katz explains to Reynaud in the exhibition catalogue that he always carries a red strip of fabric to a set, not knowing just how it will transform a space. During the production of Lost Horizon, “I took the banner to the beach; it was very windy that day, and I filmed it as it was floating almost horizontally. When I looked at the footage, I saw that the banner was covering the horizon. This gave me the idea of making an installation called Lost Horizon. In my house, I had a portrait of Marx that I had bought in a market in Moscow during the Perestroika. So this is a metaphorical installation about what happened to the dream of revolution.” At every turn in this exhibit, Katz’s moving image works revealed to visitors the formidable imagination of an artist in constant conversation with the world – as it was, as it is and as it could be.